First-year architecture student Allysa Taylor whittled away at her pumpkin during yesterday's pumpkin-carving contest at the School of Architecture on the University of Hawaii-Manoa campus. The finished pumpkins were to be donated to several children's hospitals around the island. 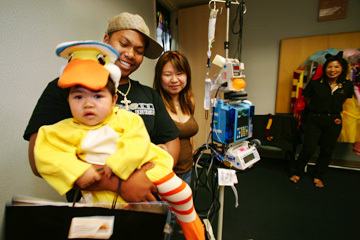 Franchesca Mamuad, dressed as a duck, did not let the monitor and IV drip keep her from enjoying the Halloween festivities with her parents, Roger and Roseann Mamuad, yesterday at the Kapiolani Medical Center. Children at the center participated in arts and crafts and other Halloween festivities. Island Insurance, Atlas Insurance Agency and Hoike Technology hosted the event.